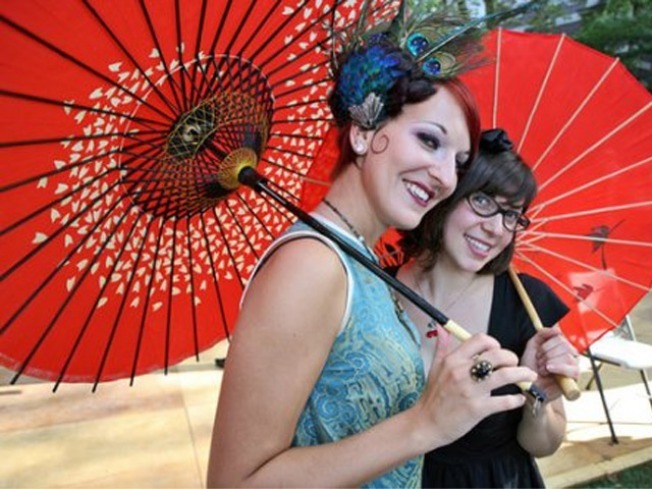 The bi-annual Jazz Age Lawn Party comes to Governor’s Island this weekend. UNFLAPPABLE: Michael Arenella brings his big Dreamland Orchestra for the bi-annual Governor’s Island Jazz Age Lawn Party, a veritable 1920s extravaganza of song, dance, libations sipped in the sun (the event is sponsored by St. Germain and the Brooklyn Brewery) and flapper-esque Gatsby-worthy outfits (there’s even a vintage bathing costume parade). Also: Pie contest! Saturday and Sunday, 11AM-6PM. PLAY GAUL: It’s not Bastille Day in NYC until a truckload of beach sand gets dumped on the street in Boerum Hill—all the better to cushion the balls of 80+ fiercely competitive pétanque teams in what’s become the largest such event in America. But the annual, ever-growing Bastille Day Brooklyn Fest is about much more than boules: It’s also a day of chomping on grilled merguez as you sip Lillet and Ricard (all from Bar Tabac) under the tricolore flags. The action’s on Smith Street (Bergen/Pacific) and Dean Street (Hoyt/Court) on Sunday, 11AM-8PM. SEASIDE SONGS: Amazingly, the Village-Voice sponsored Coney Island Siren Music Festival is already in its 10th year, and while Coney looks a lot different than it did in the event's infancy, it hasn't lost steam. Highlights of the bill include Matt and Kim, the Pains of Being Pure at Heart, Earl Greyhound, Ted Leo and the Pharmacists, Surfer Blood, plus We Are Scientists at the MHOW after-party. Saturday, 12PM.